It's a luxurious spot to sample chef Michel Hulin's cookery which is well crafted and full of ideas. : The little sister of grand L'Oustau de Baumanière is blessed with a colorful garden and a terrace shaded with mulberry trees; the farmhouse also has an absolutely immense fireplace for cool winter evenings. 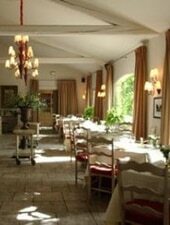 It's a luxurious spot to sample chef Michel Hulin's cookery which is well crafted and full of ideas, and certainly some of the best of Provençal food to be had. If the €100 menu (foie gras, mullet, roast catfish and jabugo oyster ravioli, sautéed saddle of lamb with chanterelle mushrooms and lemon confit) doesn't match your appetite, come by at lunch: the formule at €45, in such a noble and luxurious setting, is always interesting, which can be converted to €65 with the addition of another plate. The wine cellar is regional and international, with, of course, Charial wines. May the fête gourmande begin!